Ringworm is skin-related, these symptoms may be attributed to a simple skin condition (such as dry skin) or an allergic reaction to a pet or household product. However, since the diagnostic medical procedures can usually produce definite results, treatment after a positive diagnosis is relatively effective. Here are the four most common symptoms associated with Ringworm. 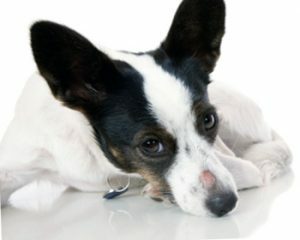 One of the most defining symptoms of Ringworm is a circular, hairless skin lesion that appears on the face, paws or neck. This is one of the main reasons why many people first thought that the condition known as “Ringworm” was caused by an actual worm (though we know this condition to be caused by a fungus). However, these skin lesions in dogs are not always necessarily circular in shape. They can be oblong, spotted, or oddly shaped. This sometimes makes Ringworm in dogs a bit hard to diagnose, since hairless skin lesions are also associated with some other medical conditions that affect dogs (such as Demodectic Mange). In many cases, small skin pustules may be present on or around the hairless skin lesions caused by the fungus associated with Ringworm. Though skin pustules frequently occur, it is possible for a dog to be infected with Ringworm and not have visible skin pustules. This symptom, as with many of the other symptoms of Ringworm, is not itself definitive enough for a positive diagnosis for Ringworm. Also, since some other medical conditions can cause skin lesions with pustules, this may also contribute to it being difficult for a veterinarian to positively diagnose a dog for Ringworm based on this physical symptom. Some dogs that are afflicted with Ringworm will have uncomfortable itching associated with the hairless skin lesions frequently caused by Ringworm. As with some of the other symptoms associated with Ringworm, this may or may not be present. 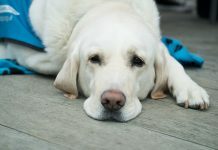 This symptom also presents a possible additional difficulty for veterinarians when diagnosing a dog’s medical condition. When a dog experiences itching in association with characteristic Ringworm skin lesions, they may scratch enough to disfigure the appearance of the lesions. This may cause an initial misdiagnosis, and can contribute to other related symptoms such as scabbing, bleeding, and further loss of hair. The presence of red, scaly skin may or may not be present in and around the area where hairless skin lesions are present. Since these skin lesions may also be oddly shaped, the presence of scaly skin may also confuse a veterinarian about the initial physical diagnosis of this condition. If red, hairless skin lesions appear on the facial area of a dog, it is very common for Ringworm to be mistaken for any number of autoimmune medical disorders. How long does ringworm last in a dog? Since Ringworm is caused by a fungal infection, once diagnosed, there are several different treatment options available. 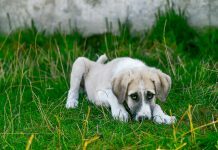 Depending on a dog’s response to the treatment, the frequency of the treatment and the type of treatment used, the total effectiveness of each of these options may vary. However, Ringworm infection is a relatively minor condition, and there are many treatments that may be recommended by a veterinarian. 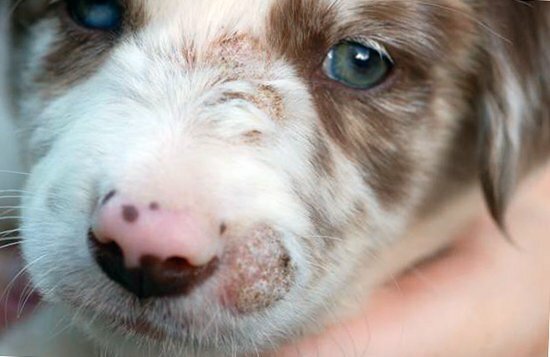 Also, in some minor cases (primarily instances of Ringworm infecting young puppies), the infection may heal on its own as a young dog’s immune system becomes stronger. For all topical treatment methods, it’s usually recommended by a veterinarian to trim all excess hair in and around the infected lesions. This will improve the effectiveness of all topical treatments, and may help to identify any possible spread of the infection. In many cases of generally localized Ringworm, an antifungal shampoo treatment is recommended as an initial treatment procedure. For more specific infections, an anti-fungal topical cream may be prescribed by a veterinarian. This allows specific infected areas to be treated. If topical treatments are not completely effective, or if a dog has a particularly severe case of Ringworm infection, a veterinarian may prescribe oral medication in addition to (or as a replacement for) topical treatments. Oral medications are usually continually used for several months, though can have some potentially serious side effects. This anti-fungal medication is used to treat Ringworm in dogs, cats, and other small animals. This medication needs to be continued for a period of time after all visible traces of the infection disappear. Since Griseofulvin may cause several serious birth defects, it can not be used in dogs that are pregnant, nursing, or who may become pregnant. It also is not used to treat male dogs that are specialized for breeding. Due to the relatively high toxicity levels of this medication, it is also not recommended to be used with young dogs or puppies. Possible side effects include vomiting, lack of appetite, depression, diarrhea, or muscle weakness. This anti-fungal medication is commonly used to treat dogs that are also immunocompromised (in addition to being infected with Ringworm). Since Ketoconazole is classified as “lipophilic”, it may lead to accumulation in fatty tissues. Ketoconazole may cause a decrease in testosterone (which is sometimes useful in treating prostate cancer). 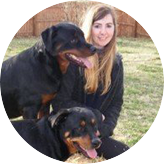 Ketoconazole also has the side effect of suppressing glucocorticoid synthesis, which is why it is sometimes used to treat Cushing’s disease in dogs. This oral medication has relatively fewer side effects than other oral antifungal medications but is considerably more expensive. It is usually used for serious infections of Ringworm. Possible side effects include vomiting, diarrhea, weight loss, jaundice, or depression. 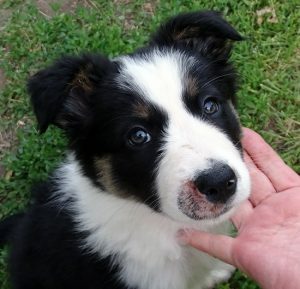 Previous articleHow do dogs get ringworm?